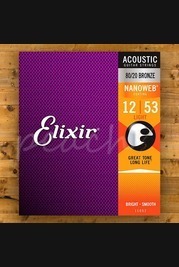 Elixir Strings are well known for the patented string coating applied to their guitar strings to both extend the string life and improve tone. This coating helps to reduce the build-up of debris and corrosion that occurs with regular and prolonged string use, giving you longer lasting, better sounding strings. A selection of well-known artists use Elixir strings including Nate Watts, Newton Falkner, Jamie MacColl, John Smith and Yolanda Charles and speak highly of the brand. Order you Elixir guitar strings from Peach Guitar today before 3pm for Next Day delivery, and spend over £100 in a single order online and enjoy FREE UK Delivery. If you'd rather hear a set of Elixir strings in action then pop in store and our friendly team will find you an Elixir strung guitar so you can experience their great tone for yourself. 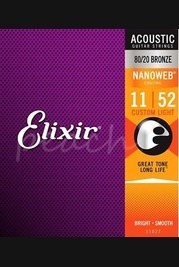 Unsure what strings you should be buying for your instruments? Contact us online or pop down to our stores and our knowledgeable team of guitar enthusiasts will help you pick out the best strings for you.